Still trying to decide what to make for the Fourth of July? This warm bean salad is a favorite of ours – it combines the creamy, nutty taste of beans with tangy feta, crunchy sharp onions and juicy cherry tomatoes. The key is to get the beans and the tomatoes mildly warmed. This makes the beans really tender and rich and the tomatoes burst with juiciness in your mouth. 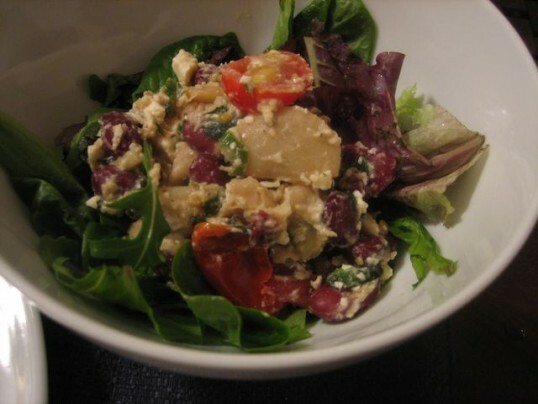 I usually serve this Warm Bean Salad on a bed of spinach, mixed greens or arugula. You could omit the greens altogether without changing the taste, which we do sometimes as well. I like to use three different types of beans so there’s different flavors, textures and colors going on. Red kidney beans, white navy beans, chickpeas, white lima beans and fava beans work well. 1. In a deep saucepan, heat about one tablespoon of olive oil. 2. Add all of the beans and cook on medium heat until tender, about 8-10 minutes, stirring occasionally so the beans don’t stick. 3. Turn the heat down to low and gently stir in the cherry tomatoes. Cook for another 2-3 minutes. 4. Remove from heat and mix in the red onions, feta cheese, salt and black pepper, cayenne pepper if you want a little heat and lemon juice. 5. Drizzle a little more olive oil over the salad if it seems too dry. 6. Plate over salad greens if using them. Sometimes we toss in a handful of croutons for a little crunch as well. This looks delicious. And easy, which also appeals. And fast, for relatively quick gratification. Ticks all my boxes. Have a great 4th N. The salad looks delicious…& different! Gonna try this ! YEE KYA BAKWAAS HAI? U EATING HOT RAJMA WITH GREENS?